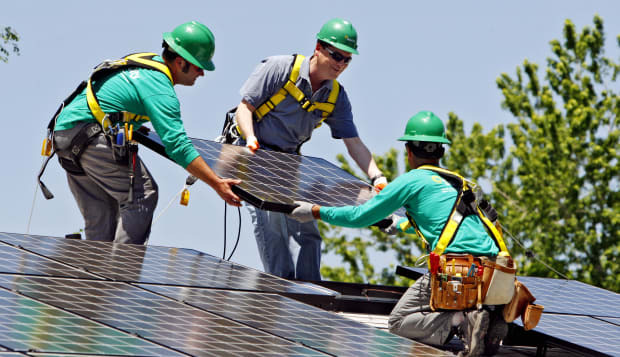 APSolarCity employees install a solar panel on a home in south Denver. Although it's the shortest month of the year, February manages to pack in a lot. Groundhog Day brings news of spring approaching. Valentine's Day is a source of anxiety no matter your relationship status. Black History Month is a time to remember an important part of our nation's culture. And the Super Bowl and award shows dominate our Sunday night plans. But what will you make this February known for? We may be in the second month of the year already, but if finding a new job is part of your plans for the year, you can make serious progress this month by checking out these 20 companies hiring right now. Location: Miami; Dallas; Union, N.J. Location: Tucson, Ariz.; Arcadia and Encino, Calif.; Orlando and West Palm Beach, Fla.; Chicago; Bloomington, Minn. Location: Carl Fisher and Estero, Fla.; Scottsdale, Ariz.; Chicago; Greenwich and New York, N.Y. Location: El Segundo, Calif.; College Park, Md. ; Washington, D.C.; Arlington, Va. Location: Santa Ana, Calif.; Ft. Lauderdale and Orlando, Fla.; Chicago; Charlotte, N.C.; Bothell, Wash.; Washington, D.C.